In 2009, Bill Dedman noticed a massive home for sale and, though it was far out of his price range, was instantly intrigued by its near-perfect preservation. The home piqued Dedman's journalistic curiosity and was the starting point for his journey into the life of Huguette Clark, the daughter of Gilded Age industrialist W.A. Clark. In Empty Mansions, Dedman pairs with Clark's cousin Paul Clark Newell, Jr. to collect the pieces of Huguette's past, highlighting her family's place in history along the way. 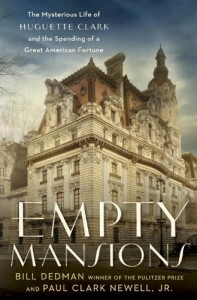 The early pages of Empty Mansions explore the extravagance of the Clark family at its height before digging into the family's rise and eventually focusing on Huguette's seclusion in later chapters. Each section is fascinating in its own way, making it possible for readers with different interests to enjoy the book as a whole. The Clark family's wealth is absolutely mind boggling, despite the numerous examples and modern comparisons Dedman and Newell give. Their New York mansion, finished in 1911, would have cost close to $250 million today-more than Rockefeller and Carnegie's homes combined. But the cost of the home was minimal, roughly the profits from one Clark copper mine over two years. Those interested in history will love the book's section on W.A. Clark's political career. His time as a state senator was wrapped in scandal and became the epitome of Gilded Age politics, even earning criticism from Mark Twain. As the book comes to a close, Dedman and Newell dig into the final, reclusive years of Huguette Clark's life and the shocking ways she chose to spend her family's fortune prior to her death at 104. Endlessly enchanting and mysterious, Empty Mansions is both a captivating story of rising power and a portrait of life under the thumb of extravagance.